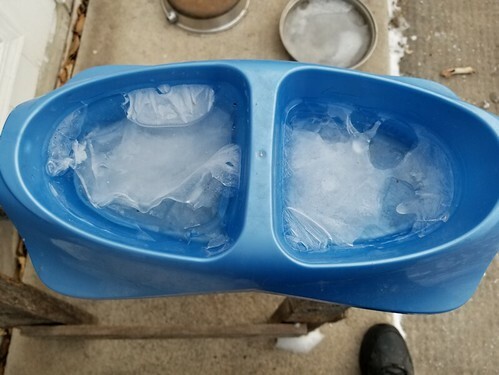 This morning, as I headed out to give the outside cats their food and warm water, I was very pleased to see that the water bowl was still on the warming set up! It was completely empty, but it was there, at least! Which meant no new ice on the concrete floor. I think we’re still going to have to increase how often we bring water out for them, though. This is one of the water dishes we still use, outside. You can see the holes made by little tongues, trying to get through the surface ice, to the water below, before it froze solid. When I go out with their food, they are normally all over each other, trying to get at the bowls of food. Oh, look. Fancy tree fruits. 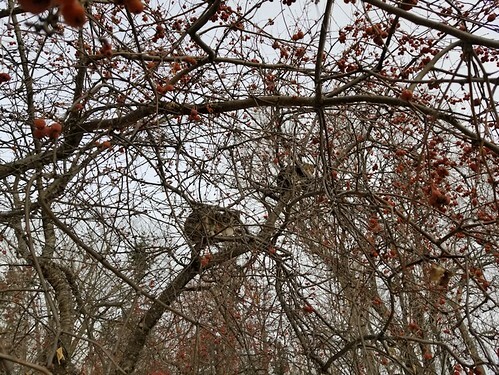 Rosencrantz and Guildenstern, hanging out in the ornamental apple tree. 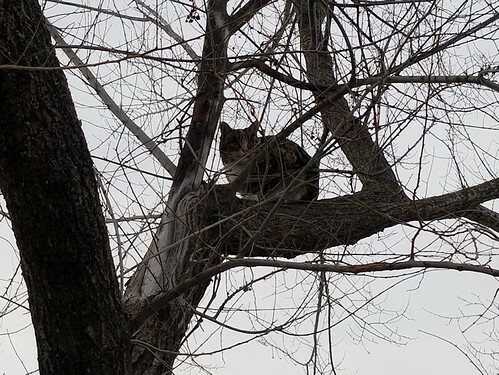 Towards the end of my rounds, Butterscotch did try to join me, but soon, she was hanging out in a tree, too! So what changed, this morning? My brother’s dog came over for a visit! He looks so sad that Butterscotch won’t come down for snuffles. 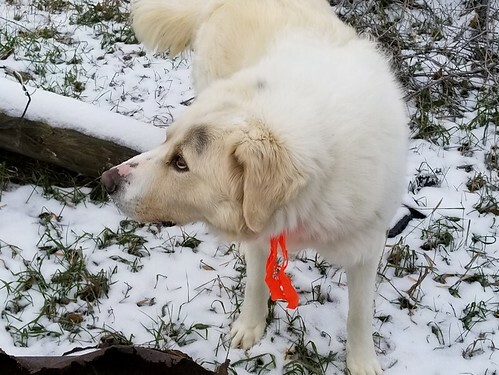 As you can see by the ribbon attached to his collar, it’s hunting season right now. In fact, I heard two gun shots this morning, while doing my rounds. Someone out there is getting meat for their freezer! While doing my rounds, I went back to see the electric fence the deer broke. I didn’t like all that wire tangled and looped up in one spot, so I found the broken end and started pulling it back. The end was near the gate, so there were quite a few holders for me to loop it through, before I reached the full length. I found an insulator on a post to loop the end through, so it wouldn’t spring back again, then found the other end and pulled that back as far as I could. The break turned out to be right next to our septic outflow. Which is looking pretty dramatic right now! The ground is too frozen to absorb the grey water, so the ice is extending quite far, already. 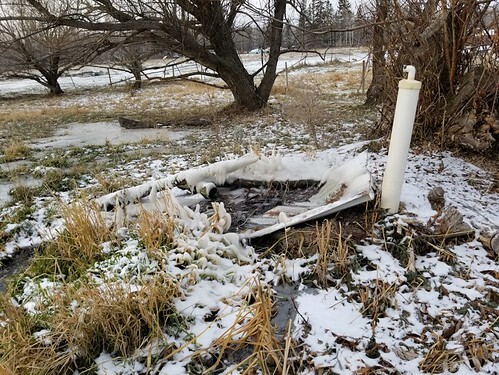 I’m guessing the piece of metal roofing was put where it is, deliberately, to prevent excess erosion from the water being pumped out the top of that pipe. There are quite a few willows here, including this one that used to be quite massive. Which says something about how quickly willows can get huge. My father planted these by just sticking branches into the marshy ground. Which means these were planted in the early to mid 70’s. I am remembering something the younger of my brothers had said, shortly after we moved here. 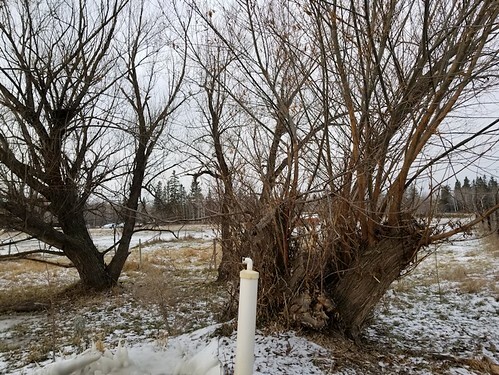 Something about how he had been trying to kill off the Chinese Elm growing by the septic field, because they were planted too close to the outflow and the roots were causing problems. I’ve gone through were a few times over the past year, and there are no Chinese elms growing here. Just the willows my late father planted. He planted willows because they are good for taking up water, and would prevent the area from becoming too marshy. Some of it is lower and forms a sort of pond, when there’s enough rain (which meant there was almost no water at all, this past year), but the outflow is closer to the barn and several outbuildings. So… I don’t know what my brother was talking about, in regards to any elms in this area. Odd.